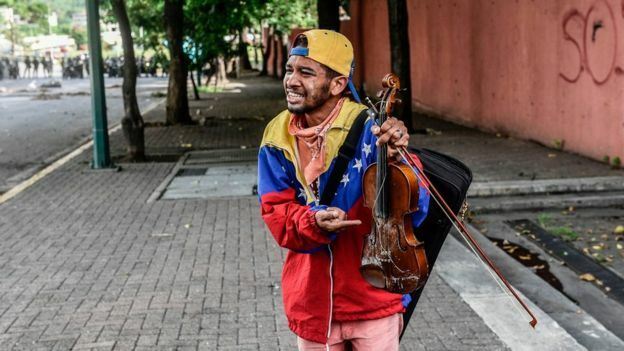 The image of Wuilly Arteaga crying after Venezuelan security forces destroyed his violin has been seen by millions of people around the world. Mr. Arteaga, 23, had joined in the protests against Venezuelan President Nicolas Maduro's government by playing patriotic songs. His look of despair speaks to what many in Venezuela are feeling as they wonder how much longer their country must suffer violence and misrule. At least 115 protesters have died in Venezuela since the opposition-organized street protests began on April 1. More than 50 of those killed have been younger than 30 and many were just teenagers. They include people like Neomar Lander, a 17-year-old protester who was reportedly shot at point-blank range with a teargas canister, and Yeison Mora, also 17, who was shot in the face while participating in a demonstration in the country's southwest. Estimating the size and demographics of protest crowds is always difficult, but two things about the protests in Venezuela are already clear. First, they are much broader and more socioeconomically diverse than the anti-Maduro protests in 2014, which seemed to comprise mostly middle-class Venezuelans. Second, many of today's protesters are young. Young people have spearheaded three waves of protest against the Chavista regime, established by Maduro's predecessor, Hugo Chavez, before he died in 2013. In 2007, it was young people who led protests against Mr. Chavez's government when it shut down the popular Radio Caracas Television and replaced it with a state-run television channel. Then, in 2014, they demonstrated against the country's rampant violent crime under Mr. Maduro and in support of their own right to protest. And now, a new generation of young people has joined with the alumni of those previous waves to demand elections and the end of the regime. The current protests have gone on for more than 90 days. Young Venezuelans are speaking out against high unemployment and the lack of economic opportunities. In 2016, 70 per cent of all protests were driven by economic concerns, with the demand for jobs chief among them. The government hasn't reported official unemployment rates in more than a year. But it is clear that Venezuelans – especially young people who cannot afford food and housing – are suffering more than ever from their country's deepening economic crisis. Young people are particularly dangerous to the regime because they have nothing to lose now, and everything to lose later. As one student leader said in 2014, "We have to protest because [the government] is stealing our future." Older people, by contrast, tend to make the opposite calculation: they do not want to risk the possessions and livelihoods they have now for an uncertain future. Still, when their own children take to the streets, they sometimes follow. The regime has only itself to blame for the protests. Like a Latin American Donald Trump, Mr. Chavez came to power on a wave of populism in 1998, and frequently boasted of his efforts to reduce unemployment. His government invested heavily in tertiary education; and by 2010, Venezuela ranked fifth worldwide in university enrolment. Many of the new public universities established during this period were closely aligned with the regime. In interviews, students have said the regime required their participation in pro-government rallies, but it also promised them government jobs after graduation. To fulfill this promise, the regime tapped the country's large oil revenues at the time to expand the public sector. But spending oil revenues to educate students for jobs that depend on future oil revenues is hardly a sustainable economic model. This became readily apparent in 2014, when oil prices started plummeting. The collapse of oil prices, combined with years of economic mismanagement, has left young Venezuelans with high expectations but no real prospects. The Maduro government's only solution seems to be stepped-up repression. The tears that Mr. Arteaga shed for his instrument and his country, like the images of mourners at young protesters' funerals, illustrates this dynamic perfectly: young people took to the streets to demand change and opportunity, and the government – a government built on promises that it cannot keep – responded with beatings and bullets. Having failed to meet its commitments, it is betraying its supporters' children with the violence it once reserved for the country's elites. The question now is who will give up first. The unofficial motto of the 2014 protests was "El que se cansa, pierde" ("You tire, you lose"). But on that occasion, the opposition blinked first and the protests fizzled out with the start of the World Cup. This time, the opposition has made more concrete demands, and has vowed to stay in the streets until those demands are met. They are calling on the government to hold a fair presidential election, free all political prisoners and open a humanitarian corridor for the country to receive much-needed food and medicine. Mr. Maduro has blamed the protesters for the country's shortages. But he will need more than populist rhetoric to mollify the people this time. Venezuelans have spoken loud and clear: They are tired of populism, and they will not tire of the streets.